and to encourage Enjoyment of everything they do. Valuing children and developing in them self-discipline, self-confidence, self-respect and self-esteem. Our five core values act as threads woven through everything we do. 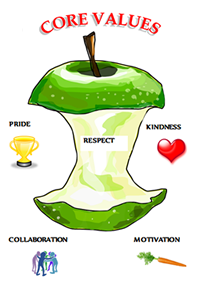 Respect, Kindness, Pride, Collaboration and Motivation. You can see these values in the everyday behaviour of our staff, our governors and our children. Bagshot Infant School recognises its responsibilities for safeguarding and promoting the welfare of all children under Section 175 of the 2002 Education Act and under the Children Act 2004 and the DfE guidance Working Together to Safeguard Children 2016.